'Prick Your Finger' aims to offer knitters the chance to make ANYTHING, which is why we are learning about sheep breads. Each sheep grows a different type of yarn. The letters on the front of our shop are knitted in one of the toughest, most weather proof wools, the ROUGH FELL. My Cousins Kit and Alison, farm 70 Rough Fell ewes up in Cumbria. (Fell is another word for mountain, ewe - a female sheep) Like most farms in Britian, it is possible to break even but difficult to make a comfortable living, so they juggle the farm with other jobs. Kit and Alison farm for the love of nature. Rough Fell roam on the open and bleak fells around south Cumbria. Farmers mark their sheep by painting spots on them, or tagging their ears and although the flock is free to roam, they usually remain together, socializing with other flocks on the mountain side. When it's time to go home, the farmers will go out on the fell and round them up with the help of a sheep dog. Kit gave me a book "Kendal Rough Fell Sheep" and I was delighted to read that Rough Fell farmers come from a long tradition of independent spirited communities, that is reflected in historical clashes with authority. In 1536 the common folk of Sedbergh and Dent (who farm Roughs) took part in one of the earliest up-risings against the church, the aristocracy, the king, and the associated systems of land tenure. 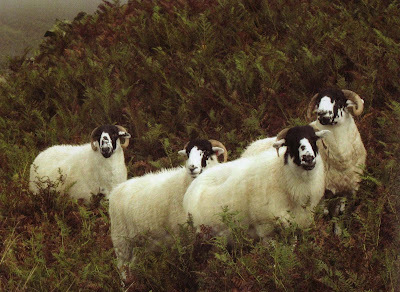 These Rough Fell communities have formed unique ways of self government and decision making, and an unusual way of sheep farming which even to day does not fit in with the standard Defra guidelines. Defra forms might ask questions like 'When did the business start? ', 'What is the post code?,' "What is the bank account?" or "Who are the legally empowered representatives?.' For farmers in remote parts, these questions, can be impossible to answer.